Daniel Benites teaches toddlers how to play tennis at Dolores Park. The view from the hill was a bit odd: optic yellow balls, a little too chunky for tennis, falling from the roof of the Dolores Park restrooms. Every minute or so, a new one would find its way from whatever was going on on the other side. In the multi-use court, 23-year-old Daniel Benites was hitting them hard, sweating under the 3 p.m. sun. “Are those Ray Bans?” he shouted at me, moments after I leaned on the black fence. “Bootleg!” I confessed. He had been warming up to teach a class, his wonky-looking drives a result of his audience. A handful of children aged 4 and 5 arrived soon, walking in line, dragged on by a couple of nannies. Kids these days train with quickstart balls, bigger and lower-bouncing. The coach’s main instruction before the start: no throwing it at each other’s faces. Benites’ formative tennis years occurred much later than his students’, and before Quickstart balls were a thing in the USTA. 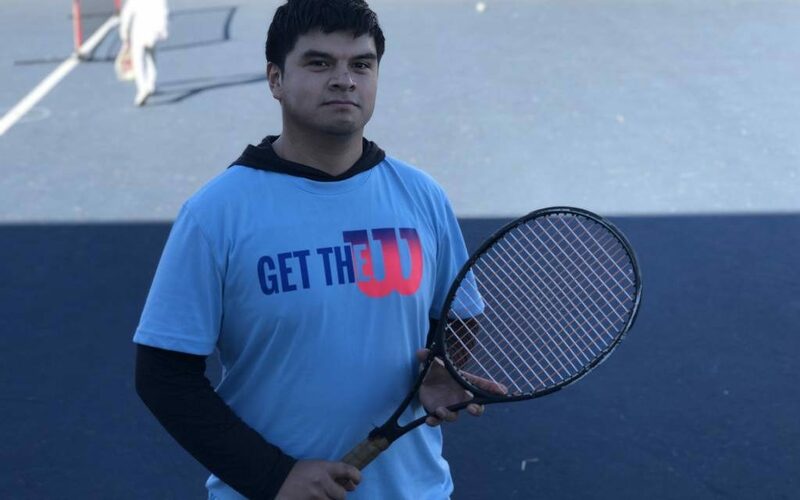 Born to a Salvadoran mother and a Mexican father, he picked up tennis in the late 2000’s, through a community program based in the courts of Mission Playgrounds. He recalls being the chubby little boy running around, and getting his first racquet as a gift from other kids’ parents. It was all about tennis from then on. “I’m pretty good,” he claimed, his prowess unverified because of the circumstances. Instead, he took on the class before his students got too rowdy. Three years of coaching tiny humans seem to have given him plenty of patience, and a good grasp on the levels of energy they bring to every class. “This is my final week here, though. I’m going to start teaching at a school soon,” he said. Tennis graduation. NextSan Francisco dodged a bullet with judge’s Census ruling. For now.